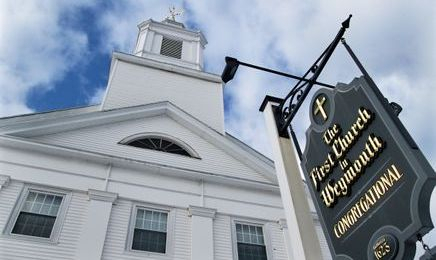 The First Church in Weymouth celebrates the sacrament of Baptism for all persons, including infants, who desire to be joined to Christ and His church. In the case of infants and young children, this desire is expressed and attested to by the faith of the parents. Baptisms are normally celebrated within the context of our Sunday Worship Service as they are a celebration of the faith community, as well as a celebration for the family of the baptized. Those who desire to be baptized should contact the church directly to arrange a date. Most Sunday Worship Services are available, and arrangements for other times can be made if necessary. There is no fee associated with a baptism performed within the Sunday Worship Service. There is a fee of $100 for the custodian if a baptism is arranged for a different time in the church sanctuary. Normally we celebrate the Sacrament of Baptism via pouring, using a small amount of water from our font and pouring it on the head of the baptized. If you are interested in other arrangements (e.g. full immersion baptism performed elsewhere) please contact the Pastor directly. You may be interested to know that the water we bless and use for Baptisms contains a small amount of water from the Jordan River! This river has a major significance in our faith history; it is the place where the Israelites crossed over into the Promised Land, and it is the site where Jesus Christ was baptized by John the Baptist.